This unique device uses collision techniques. 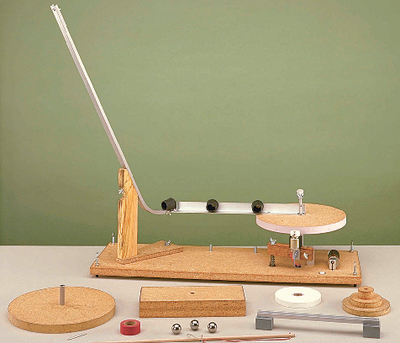 Designed for three experiments in the PSSC Advanced Topics Supplement, this apparatus lets students research a variety of phenomena including angular momentum, rotational inertia, and the relationship between torque and angular acceleration. The 25 cm dia. 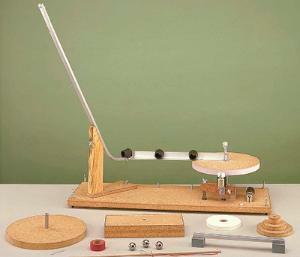 base wheel revolves on a low-friction bearing, and an provided acceleration timer records data. Three cups catch the metal balls that roll down the chute. The unit sits on a 72 cm long base and is easy to assemble. Ordering information: This kit includes an adjustable launching chute, three steel balls, a drop-on wheel, specially weighted bar and dumbbell, and waxed recording tape. The recording timer requires a C battery.